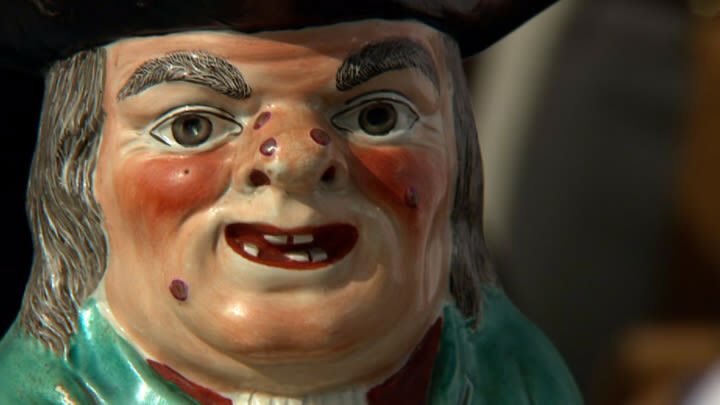 We've all seen them ... those ugly old toby jugs staring grotesquely from within our mum, nanna or aunt's china cabinet. They may be hideous, but geez, some toby jugs are valuable. Maybe you've inherited some, or been left with the task of sorting through all those dust-gathering pieces of china when a dear loved one has died. Read more: Do you have this valuable $1 coin? Well, don't donate them to the op shop just yet. Some of those ghastly creatures actually sell for thousands of dollars. Toby jugs fall into two categories. The first date back to 1780s England, to Staffordshire, and are pearlware, creamware and saltglaze stoneware. 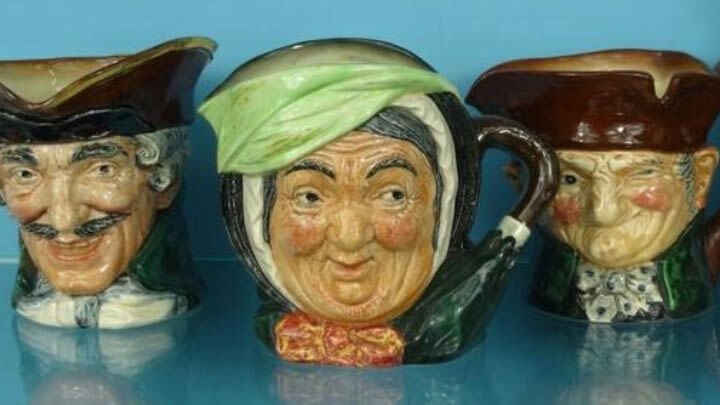 Toby jugs are recognisable as a seated, fairly jovial, stout man dressed in the clothes of the period, wearing a tri-corn hat, usually puffing on a pipe and holding a mug of beer. The hat forms a pouring spout and a handle is attached to the rear. Many look quite crudely painted. A variety of Doulton character mugs. Prized Royal Doulton character mugs can fetch from a few dollars, to hundreds. Many collectors focus on these - buying large numbers of them and mid-Victorian mugs. But it is the rarer, pre-1820 toby jugs that are worth the big money - with some fetching up to $12,000 or more. So if you feel you may be sitting on a treasure, you may want to check out this website, a UK antiques dealer specialing in rare and unique tobys. And if you do, why not share your tale of discovery - with pictures, of course - with the rest of the Ys community? We'd love to hear from you! I'm off to mum's! I'm pretty sure I spotted one of hers on that UK website. What a joy for her if I'm right!